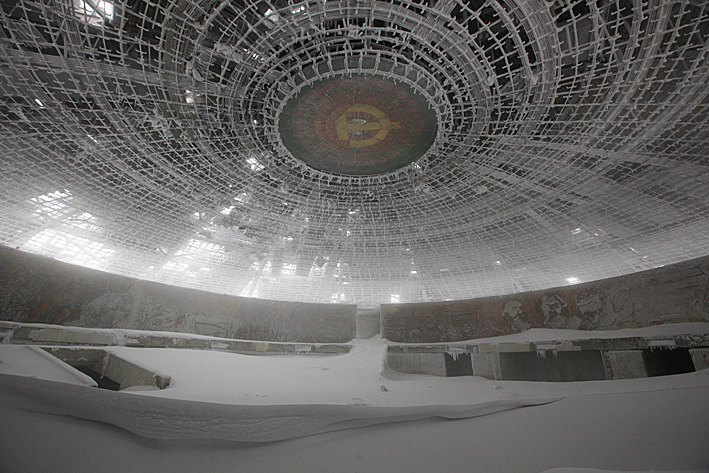 I first heard about the Buzludzha monument (pronounced Buz’ol’ja) last summer when I was attending a photo festival in Bulgaria. Alongside me judging a photography competition was Alexander Ivanov, a Bulgarian photographer who had gained national notoriety after spending the last 10 years shooting ‘Bulgaria from the Air’. Back then he showed me some pictures of what looked to me like a cross between a flying saucer and Doctor Evil’s hideout perched atop a glorious mountain range. I love that we live in a world where a place like this actually exists. And has been allowed to go to ruin, making it infinitely more dramatic-looking. I couldn’t even decide which picture to post, they’re all so amazing. Just stop whatever you’re doing now and check them all out.